Wedged between the River Seine and the Canal Saint-Denis is a spit of land where different visions of contemporary Paris come together in the most precarious of ways. This is not the Seine of romantic lore or philosophical musings. Rather, it’s a post-industrial mix of working waterfront, aging office buildings and a variety of homes and apartment complexes. Nor is it actually Paris. A stone’s throw from the eponymous station of the RER commuter train, this is Saint-Denis, a major banlieue city that can boast of being both an ancient burial site for French kings and a key node in the birth of French hip-hop. Virtually all of Saint-Denis has been part of one urban development plan after another over the past 40 years. Once the epitome of a Parisian red-belt industrial city, the southern half of Saint-Denis was transformed, starting from the late 1980s, into a complex of office buildings, housing developments, shopping centers and the country’s citadel du sport, the Stade de France. It is now an important center of the Grand Paris project, which will add major transportation extensions. It’s hard to find a place in any old industrialized city where change is coming so fast and from so many directions. To paraphrase Ed Soja, it all comes together in Saint-Denis. Just shy of the northern terminus of this human-made peninsula is a 1960s office building. Over the past three years, Le 6b, named after its address on the Quai de Seine, has transformed into a “new site of creation and diffusion.” It hosts more than 200 artists, architects, small businesses and artisans in roughly 150 spaces. People don’t live there — it is entirely a work building, a fusion of the shared office trend, with a post-squat vibe. There is a strong emphasis on collaboration and cross-pollination. 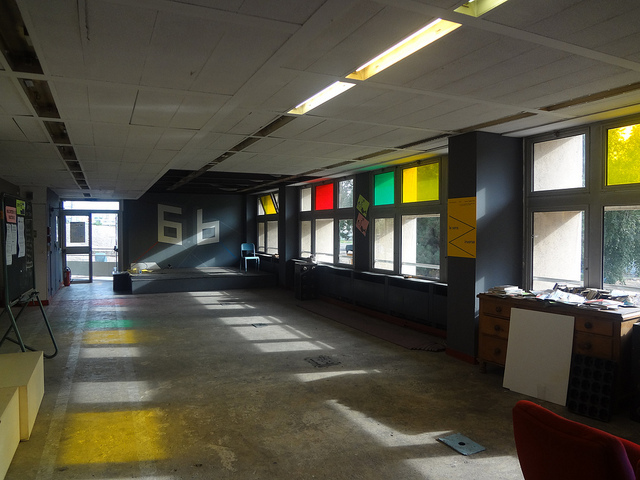 The entire second floor is shared space, with a restaurant, cinema, gallery and ample room to interact. There is also a politics to the 6b. It was specifically founded to intervene in a changing Saint-Denis. Its internal goals are combined with an attempt to engage with the surrounding neighborhood and the complex racial and class politics of its transformation. It’s also completely legal — 6b leases the building from Bremond, the developer of the vast Néaucité complex going up next door. Local politicians regularly meet at 6b, and it often appears in public- and private-sector promotional material. Yet 6b’s lease ends in December, and it has no long-term guarantee as to its future. The Néaucité development, which is already underway, will contain 1,600 new residents in 700 units and over 25,000 square meters of office and commercial space. Like many hip developers, Néaucité’s owners tout 6b as a sign of their sensitivity to their surroundings. 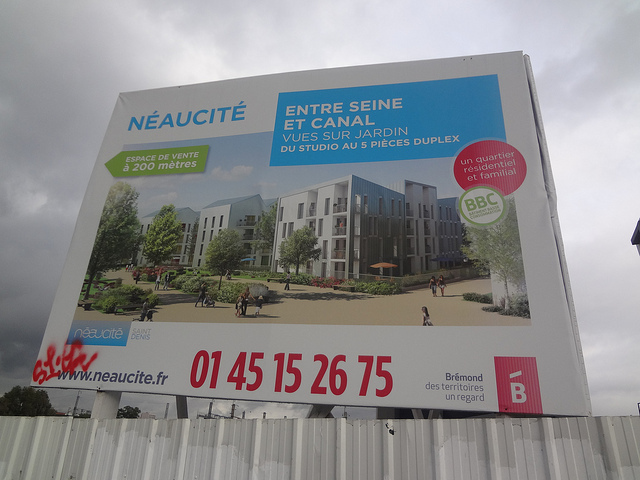 Along with pictures of breakdancers on their website, 6b is integral to the selling of Néaucité, both to potential residents and local officials. But when you click on the 6b building on the development’s interactive site, the precarity is clear: the site says that the building “today shelters the 6b association” and that future renovations will “permit it to house offices and ‘creative premises.’” But it already does this, based on an internal economic model which keeps costs down and rents low — living, breathing proof of the wisdom of Jane Jacobs’s oft-forgotten maxim about the use of old buildings. The controversial and complex relationship between creative types and property developers in gentrifying and changing communities is now etched into the firmament of post-industrial urban change. At the very least, 6b appears to have friends in high places, and its disappearance or destruction would not go unnoticed. The same cannot necessarily be said about their neighbors across the canal. 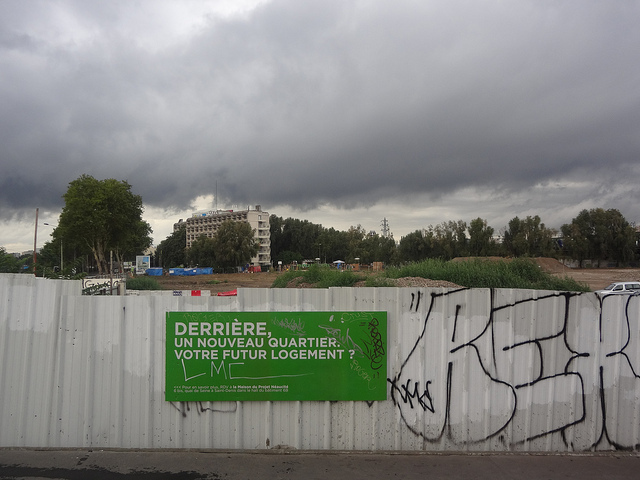 Visible from every point on the canal side of the future Néaucité is one of many Roma settlements throughout Saint-Denis, including one almost underneath the Stade de France. The administration of the new Socialist President François Hollande appears to be continuing his predecessor’s policy of removing Roma camps. 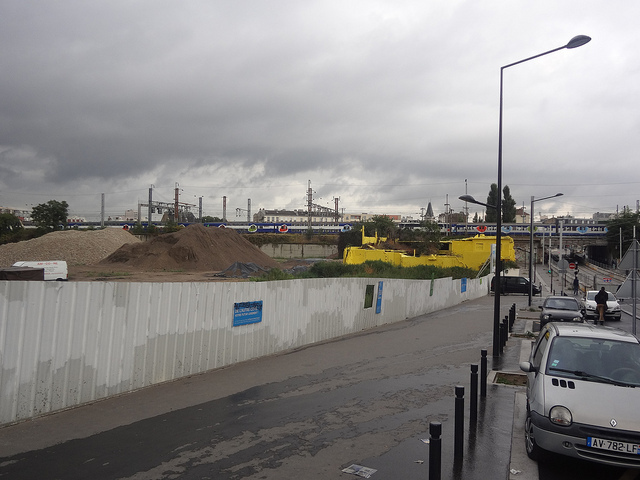 Two camps in neighboring Stains were removed in August, part of a wave of removals throughout France. 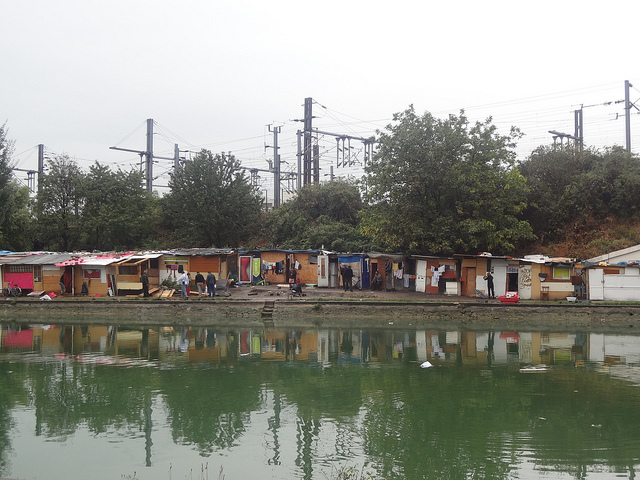 Like the issue of artists and gentrification, the question of Roma camps is not clear cut. Informal housing is no stranger to the north of Paris, which was home to many bidonvilles in the era before the grands ensembles were built. Some Roma have been migrated to Villages d’Insertion or other legal, if temporary, spaces throughout the region. There are efforts to expand education and employment opportunities for the Roma population in France, which is estimated at 15,000 people, mostly from Bulgaria and Romania. The Roma are conspicuously, if unsurprisingly, absent from Néaucité's imagery. They remain in a state of precarity with which they are all too familiar.